CyberGhost VPN has many great features and is one of the best for beginners. Apps for all device types. Use on up to 7 devices. CyberGhost VPN is a provider that’s been around as long as we can remember in the VPN industry but in recent years they’ve been pushing hard both with expansion and features. But how has all this expansion affected the service? 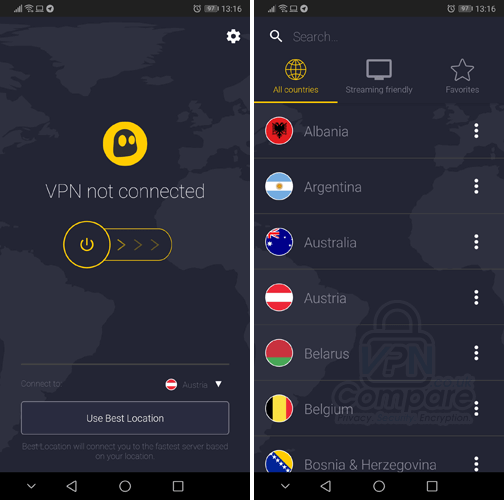 We’ve been taking a look at this well-known VPN service to see if they still live up to their reputation. CyberGhost VPN follows the industry standard VPN package choice in that there’s one standard package that differs only by price. What you’ll immediately be bowled over by is the offer prices available. If you subscribe for what are admittedly long periods of time then you’ll make some huge savings. Noticeably the 2 and 3-year packages are much cheaper than the 1-month package. I really wouldn’t recommend choosing the one month package because in comparison to other providers it’s at the higher end of the scale. While the 3-year package offers amazing value it’s worth remembering that the quality of VPN services can differ over time. While CyberGhost VPN offers an all-round good service right now, there’s no guarantee that it will be the case in three years time. While it’s not to say anything will change it’s a consideration you’ll need to factor and although more expensive the 2-year deal may work out less risky in the long run. The only other notable feature is the 1-month package has a 14-day money back guarantee while the longer packages have 45-day money back guarantees. Payment is accepted via Credit Card, Paypal or Bitcoin. The CyberGhost VPN service offers access to OpenVPN, L2TP and IKEv2. There are different levels of protocol availability depending on what device you’re using but this is standard across the industry. The full range of protocols is mostly offered on their desktop apps. PPTP has been dropped from the service throughout their apps and due to the insecure nature of it, it’s a welcomed decision. You can still configure PPTP manually if you need it and it’s accessible via the CyberGhost control panel. CyberGhost VPN claims to be a fully no-log VPN service. They state that they store no logs of what you do while connected to their service nor any metadata. Metadata is the who and the where. This means they don’t record details of when you connected, what times you connected or what servers you connected to. This can be as important as logging actual content because the times you connect and other such details could link you to your usage. It has to be pointed out that CyberGhost VPN hasn’t had their claims tested. Equally, there have been no legal cases to suggest that their claims aren’t sound either. 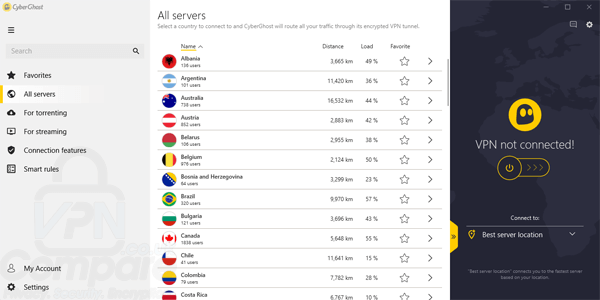 CyberGhost VPN continues to offer VPN servers in 60 countries across the world. This is the same number as last year when we reviewed their service. Coverage is good across North, Central and South America, Europe, Asia and the Australian region. Africa and the Middle East are somewhat under-resourced which is common in the VPN industry but there are servers in South Africa and Kenya available. Although CyberGhost VPN hasn’t introduced any new countries since we tested the service a year ago, they have expanded greatly on actual servers. Last year we noted 2,747 servers and in the space of a year, this has increased to 3,396 individual VPN servers. This is a huge increase and it’s great to see the service being invested in. One feature we really liked about CyberGhost VPN is they have specific servers for specific needs. Torrenting has their own range of servers but where the service really comes into its own is their “Streaming Friendly” selection. These are servers located across the world set for accessing specific TV services. They’ve got servers to unblock and access everything from Netflix to BBC iPlayer, Hulu to Sky Go and more. CyberGhost VPN allows you to use their service on up to 7-devices at the same time. This is at the higher end of the scale in comparison to others available, although it certainly isn’t the highest. CyberGhost VPN work slightly different to other services in that the type of device connected is tied to your account. If you hit the 7-device limit then you need to de-register one device before being allowed to connect any further devices. This isn’t common and a little bit inconvenient although it’s an expected way of stopping you from abusing the service. CyberGhost VPN works with a huge range of TV streaming sites and is one of the main benefits of the service. If you’re an entertainment hound who likes watching the latest movies, TV shows and sports then the chances are the service will let you access the site that shows it. This is especially good if you’re travelling outside your home country because you’ll still be able to login to most of your subscription services. This includes the American Netflix website but it’s also possible to access the French and German Netflix’s sites too. All of CyberGhost VPN’s apps come with built-in features to protect against a range of everyday internet annoyances such as blocking ads, malicious websites and online tracking plus forcing HTTPS when possible and compressing your data to save on your internet usage. These additional features can be disabled or enabled at will and give an extra layer of protection to the service which isn’t standard across all providers. CyberGhost VPN offers apps for both Android and Apple iOS devices. So no matter what type of phone or tablet you’ve got you’ll be able to use the service. The apps are actually really simple to use and even if you’re not good with technology you could, if you wanted, click to Connect and let the app do the work for you. It’ll connect you to the best location available allowing you to then forget about it. If you want to choose a server then there’s a dedicated area which opens in a new window displaying servers by country. You can either click to connect to the best available there or drill down even deeper and select an individual server. The “Streaming friendly” choices are also available on the mobile apps so if you’re after unblocking and watching a streaming site then you’re covered too. Behind the scenes there are a few options you can play around with. As detailed earlier, these are all based around blocking malware, adverts, online tracking and compressing your data. This final option alone could be very worthwhile if you’ve got a limited mobile data plan and while it’s not going to allow you to double your usage it may let you squeeze out a bit more internet usage. Overall the apps are well designed and easy to use. While they’re not overloaded with features they do have enough to keep you happy. CyberGhost VPN’s desktop apps are available for both Windows and Mac OS computers. They can either be used in a slim-line window that looks similar to the mobile app and deals directly with connection or expanded to a larger window that gives you more options to play around with. Connection and limited server selection can be made from the reduced window but anything more and you’ll need to expand. Servers can be selected by country including individual servers, servers ‘for torrenting’ or servers ‘for streaming’. Like the mobile apps the ‘for streaming’ option really comes in useful allowing you to connect to the correct server to unblock whatever streaming site you’re trying to access. Connection features are available as with the mobile apps that allow you to protect against ads, malware and tracking. It also allows you to force HTTPS connections where available and the data compression option is present too. There’s a section dedicated to ‘Smart Rules’ and a neat feature is allowing you to have certain desktop apps fall outside the VPN connection. So if for example you wanted to protect your online privacy but for some reason needed your email client to use your regular connection then this feature covers your needs. Further options include DNS Leak Protection and an option to disable IPv6 connections to prevent leaks occurring there. Overall the desktop apps again are easy enough to use and have a range of additional features that add protection. There doesn’t appear to be a kill switch available which seems like a large oversight and with so many other features available it’s one we would like to see added in the near future. 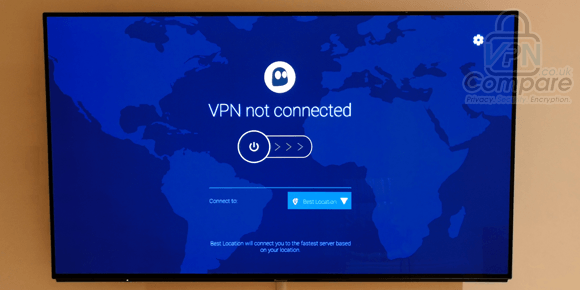 Alongside the mobile and desktop apps, CyberGhost VPN also has both a Google Chrome extension and an Amazon Fire TV app. The Amazon Fire TV app works across Fire TV, Fire TV Stick and Fire TV Cube devices. It’s actually one of the best designed we’ve seen. Navigation works well on a large TV screen and connection can be made quickly just by clicking the connect button. If you need to select a specific country then that’s just one click and a menu away. We really liked that the ‘Streaming Friendly’ options are available in the Fire TV app because after all, it’s unblocking streaming sites that you’re mostly going to be interested in on your TV. Using CyberGhost VPN over a period of weeks for everything from browsing websites, using Skype to downloading and streaming movies caused no issues. We didn’t notice any slowdowns for everyday tasks nor any unexpected disconnects when connected for large periods of time. Aside from streaming high-quality video, most general internet tasks shouldn’t cause any issues and only the very worst VPN services would see problems with this type of usage. To put CyberGhost VPN to the test we wanted to push their service to the limit and so ran some speed tests. We downloaded a test file from a residential connection in the UK and then ran the same test across a random selection of CyberGhost VPN’s servers. We were using a Windows PC at the time with OpenVPN 256-bit encryption. Overall CyberGhost VPN’s speeds are very respectable and will allow you to use the service for a wide range of uses. Streaming video at high-quality won’t be an issue even when connected to servers at distance. While CyberGhost VPN offers impressive speeds they’re not quite as fast as our top 3 providers, ExpressVPN, NordVPN and IPVanish and although not far off, just fall ever so short in the speed stakes. CyberGhost VPN offers access via OpenVPN, L2TP and IKEv2. It’s good to see they’ve dropped the PPTP protocol within their apps because it’s insecure, although it is still possible to use through manual set-up if needed. All protocols aside from PPTP offer 256-bit encryption. OpenVPN makes use of AES-256-CBC encryption. Authentication is handled by a 4096-bit RSA key which is at the top of the scale. While one or two other providers do offer this, it’s not common. The ‘Transparency Report’ is one of the nicest sections of their policy area and shows you how many DMCA, legal request and malware requests they have received over the past few years. While they don’t publish individual requests like one or two other providers it is nice to see some statistics and you can read some more in-depth reports for earlier years if you so wish. Overall we can’t see any issues here but you may want to glance over their policies before you sign up to make sure you agree with them. CyberGhost VPN is one of the most improved VPN services in recent years. We commended them last year for upgrades, introducing new features and overall improvements. This year it’s much the same. While they haven’t added any new server locations they have added a whole heap of extra servers. They’ve also completely redesigned their range of apps and launched a dedicated Amazon App. We really like their streaming feature that includes dedicated servers to unblock all of the most popular streaming services. Everything from Netflix to Hulu and BBC iPlayer to Sky Go works with the service. The service has received a boost in encryption both by pushing IKEv2 more across their app range and dropping the insecure PPTP protocol even though it’s still available for manual set-up. They also increased their key size for authentication and it’s these little security boosts that add to the overall effectiveness of the service. Speeds on the service were good and while there are faster services out there the speed loss incurred on our regular connection was minimal. You’ll have no trouble carrying out speed intensive tasks such as streaming high-quality video. We would like to see a couple more server locations and the speeds could be cranked up just a smidge higher but that’s only if we’re nitpicking.